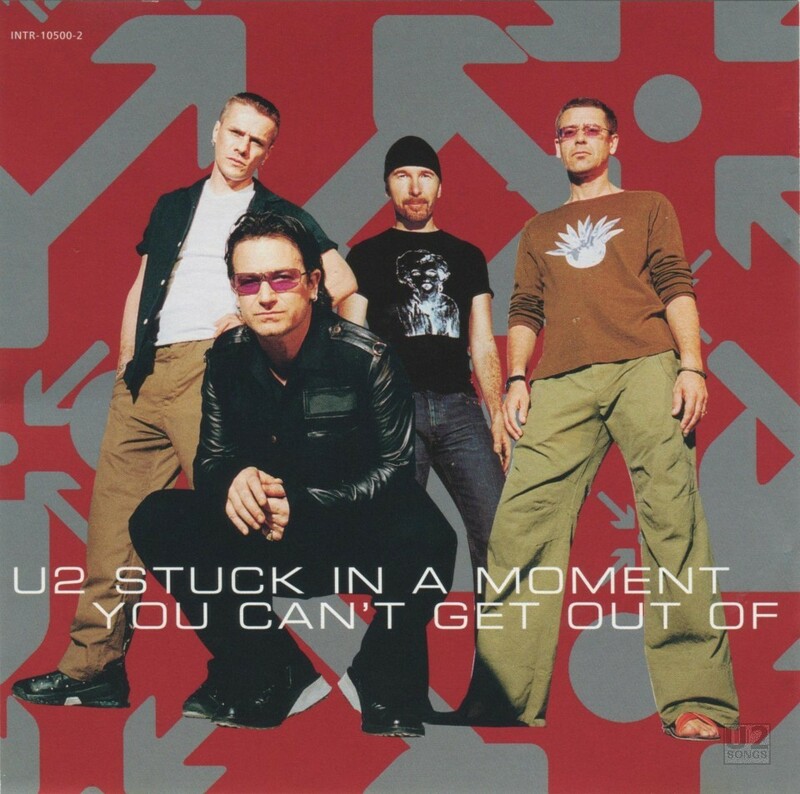 “Stuck in a Moment You Can’t Get Out Of” was issued as the second single from U2’s “All That You Can’t Leave Behind” in the UK, Australia, and most of the world. The exception was in North America, where “Walk On” was issued as the second single and “Stuck in a Moment You Can’t Get Out Of” was issued as the fourth single. As there were two different release schedules there were two rounds of promotional releases for “Stuck in a Moment You Can’t Get Out Of”. A jukebox 7-inch vinyl record was issued in the UK. The promotional release was the “Album Version” and the b-side featured “Big Girls are Best”. The single was released in a generic sleeve. It appears to have been pressed with a small center hole, but then later drilled out to create a larger hole in the center. This release was first mentioned in December 2000. In late 2000 two 5-inch promotional CDs were released. In November 2000 a CD was issued in the UK featuring the album version of “Stuck in a Moment”. The front cover was two beige bars surrounding a black bar, while the inside of the cover insert had a picture of Bono and Larry that had been tinted red. In December 2000 a 5-inch promotional CD also appeared in Mexico. The inside cover from the UK single became the front cover for the Mexican single. The Mexican single not only featured the album version of “Stuck in a Moment You Can’t Get Out Of” but also featured eleven interview clips which featured The Edge answering questions about the release of “All That You Can’t Leave Behind” with each clip discussing a different song. These clips are between 00:13 and 00:37 in length. Lyrics by Bono and the Edge. Synthesizers: Brian Eno and Bono. Additional Guitar: Daniel Lanois. Brass by Paul Barrett. Produced by Daniel Lanois and Brian Eno. Engineered by Richard Rainey. Assisted by Chris Heaney. Mixed by Tim Palmer in Scream Studios, Los Angeles. Assisted by Jay Goin. Music by U2. Lyrics by Bono and the Edge. Synthesizers by Brian Eno and the Edge. Additional guitar by Daniel Lanois. Brass by Paul Barrett. Produced by Daniel Lanois and Brian Eno.